Jonty wins the post of the week award. He has chosen to write about a mythical creature 'The Hydra'. It is exciting to see him playing around with language and experimenting using descriptive words. Well done Jonty... Bring it on! Have a read and let him know what you think. The Pukeko and Mrs Clarke. Room 19 are blessed to have the fabulous Mrs Clarke work with a group of students during Literacy. All our reading groups have been named after NZ Native Birds and Mrs Clarke works with the 'Pukeko' group. Throughout the term I have observed a number of wonderful activities this lucky group get to experience with Mrs Clarkes guidance. Here is a movie made by the Pukeko group explaining how they made their kites. Thanks Mrs Clarke we love you! 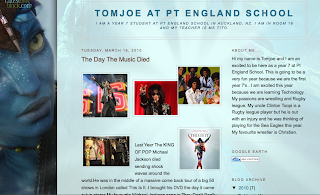 Tomjoe's Blog is my (Ms T's) choice for blog of the week. He was the first student to chose a new 'bling' or background for his blog and has a number of people from all over the world checking out his posts. It helps to have whanau or family spread around various parts of the world too - read some of his comments from family members and feel free to leave one yourself. The competition is fierce with Feki 'blinging' his blog today :) Click on the link 'Blog of the week' to check out Tomjoes interests etc. I loved the Avatar theme he chose - Great movie! Oh by the way, students are encouraged to post regularly and get to 'bling' their blog and add 'extras' to their blog to personalise them.